Old McDonald had a farm.... and his animals came to visit! 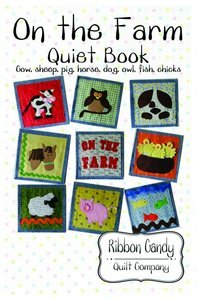 This quiet book is perfect for any little one who loves animals. 6" pages are just the right size for their little hands. They will spend hours discovering their new animal friends and learn the names and sounds they make. Your child can enjoy a world filled with interesting new it’s a wonderful sensory teacher as well. The pattern contains full size templates and very detailed and easy to follow instructions. All the animals are sewn down to the pages, except the chicks, they are finger puppets that sit in the nest.